Chapter 6 concludes what we might call the narrative portion of the book of Daniel inclusive of chapter 1 through 6 while this chapter begins what can be understood as the apocalyptic or prophetic section. But, this chapter, as well as chapters 8 through 12, are all supplementary or complementary to Nebuchadnezzar’s dream of the great metal image of chapter 2. They flesh out in greater detail the interpretations Daniel gave to that phenomenal dream back when he was only a young man in his teens. 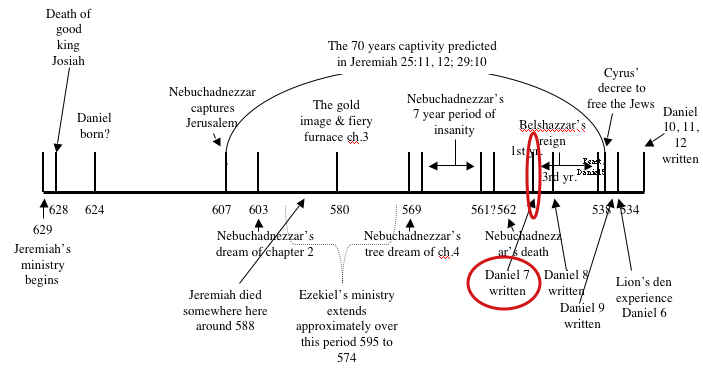 As it was, the remainder of Daniel’s life, ever since he witnessed to king Nebuchadnezzar in 603 B.C., was spent in the context of that dream, for he never forgot it and must have been struck with awe when he actually witnessed the fulfillment of its first stage at the transition point between the “head of gold” and the “breast and arms of silver” (Daniel 2:24-39). That was when “Darius the Median took the kingdom” (Daniel 5:31) away from Belshazzar the Babylonian. But that was no accident or coincidence. It was done that way though the direct inspiration of God through the Holy Spirit who, had the broad over-all picture of world events from the beginning to the end of time. Verse 1: In the first year of Belshazzar king of Babylon Daniel had a dream and visions of his head upon his bed: then he wrote the dream, and told the sum of the matters. Belshazzar’s “great feast” of chapter 5 took place in the last year of his reign which was 539 B.C. His “first year” was 553 B.C. when Nabonidus, his father, foolishly made him co-regent with himself so he could devote himself to matters other than the rule of Babylon. Therefore, Belshazzar’s rule lasted some 14 years during which he evidently plunged into a life of wanton self-gratification. While Daniel was probably around 71 years of age at this time, he may have been much older, perhaps nearing the end of his life at the time he actually wrote or dictated the remainder of his book. But, interestingly, chapter 7, along with chapters 2 through 6, were written in Aramaic, while chapters 1, then 8 through 12 were all in Hebrew suggesting they were written at different times during Daniel’s life. Some believe that the Aramaic portion was written earlier for the benefit of the Babylonians, and the Hebrew for his contemporaries later in his life. But, while Daniel’s political life came to a virtual standstill during Belshazzar reign, his spiritual life blossomed. Note Daniel’s terse mention that he “told the sum” or the basic substance of the plurality “of the matters.” We can only imagine what other things he may have been shown. But, speculation is not called for because the subsequent, parallel visions and dreams he writes about in chapters 8, 9, and 10 through 12 fill in, at least a portion of what he does not reveal here. As it was, “his wonderful prophecies, as recorded by him in chapters seven to twelve . . . were not fully understood even by the prophet himself . . . [nevertheless, they] demand our special attention, as they relate to the very time in which we are living.” If that doesn’t perk our interest, nothing will! Verse 2: Daniel spake and said, I saw in my vision by night, and, behold, the four winds of the heaven strove upon the great sea. If we are willing to accept inspiration: “The four winds of heaven striving upon the great sea represent the terrible scenes of conquest and revolution by which kingdoms have attained to power.” Therefore, “winds” represent war, and the “great sea” represents “kingdoms.” That “power” lies in the hand of the strongest, suggesting a “survival of the fittest” paradigm, a concept thought of long before Darwin! As our study continues, we will find Daniel’s visions often referring to war and conflict. This is not because God approves, but because Satan, who started the first “war in heaven” (Revelation 12:7), is in charge of the earth. And when he is in charge, war is inevitable. Compared to all the other things of earth that distract and disrupt, the power of war to grip the mind is awesome. It rivets the attention keeping men intensely preoccupied for it impacts all who stand in its path. Verse 3: And four great beasts came up from the sea, diverse one from another. Most would conclude these “beasts,” like the wind and the sea, are also figurative. So, using Smith’s rule that the “figurative must always be interpreted by that which is literal,” what is the literal interpretation of the “four great beasts?” We don’t have to guess because an angel told Daniel: “These great beasts, which are four, are four kings, which shall arise out of the earth”(verse 17). It is also clear, because of their origins from wind and sea, that the “four kings” represent kingdoms, not the individual kings who ruled during the time of the kingdom. Consider what Daniel told king Nebuchadnezzar: “after thee shall arise another kingdom . . .” (Daniel 2:39). That other “kingdom” did not “arise” as soon as Nebuchadnezzar died, but after five other individual kings succeeded him, all representing the “kingdom” of Babylon. Consequently, an individual “king,” reigns only a portion of the time that his “kingdom” lasts. So, again, these “four great beasts” represent kingdoms, not individual “kings” like Nebuchadnezzar. Some stumble over the wording of verse 3 concluding that because the “beasts” are depicted all at once, they represent four kingdoms that appeared simultaneously. But, notice in verses 4 to 7 that they are numbered consecutively as “the first, a second” then “another” and finally, “the fourth.” Therefore, they do not arise simultaneously, but consecutively, one-after-another in distinct sequence. 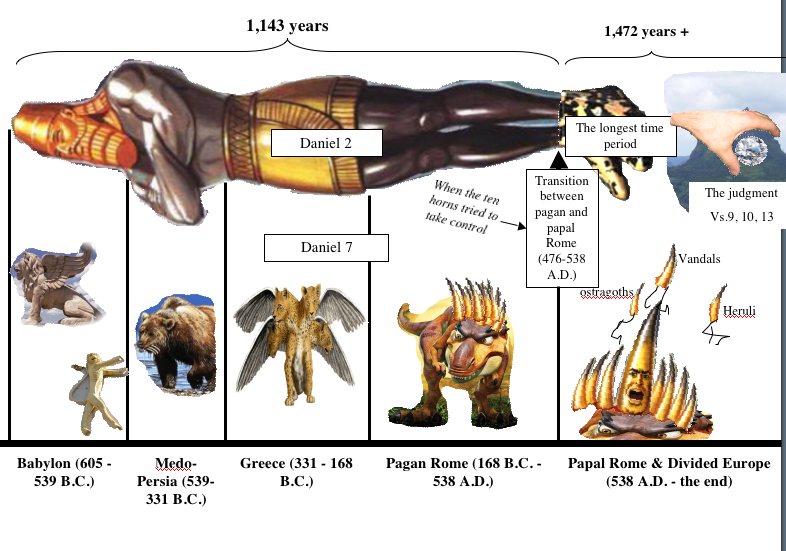 We see the same sequential order of kingdoms depicted by four elements (gold, silver, brass and iron) of the great image of Daniel 2 (verses 24-45) and it is perfectly reasonable to assume these “four great beasts” are not only also sequential but parallel to the “gold, silver, brass” and “iron” of Nebuchadnezzar’s dream. Why such repetition? While Biblical symbols are graphic representations of reality in general, they often lack specificity and require other parallel symbols, the even literal events, to fill in the detail lacking in the original. We will see this principle being used throughout Daniel’s succeeding visions as well as this one. Verse 4: The first was like a lion, and had eagle’s wings: I beheld till the wings thereof were plucked, and it was lifted up from the earth, and made stand upon the feet as a man, and a man’s heart was given to it. So, here we go with the beginning of the sequence we just talked about. The “first,” being one of the “four great beasts,” was also the “first” to emerge from “the great sea.” While figures of winged lions that have been found by archeologists in the ancient ruins of Babylon do not necessarily prove it parallel to the first beast, it is certainly substantiating evidence. Furthermore, it had to be a very familiar figure to Daniel who must have immediately associated it with the Babylonian empire. Then, the strange transformation of the lion with its “wings” removed and caused to stand up on its hind feet coupled with a heart transplant, is suggestive of three things that would, at least, cripple the lion. Where once it could fly, now it was grounded. Where it once had “four feet” on the ground, and then limited to only two, would, for a lion, be crippling. Then having a man’s “heart” substituted for the heart of a lion suggests diminished courage and aggressiveness. Daniel witnessed all of those characteristics being played out when Nebuchadnezzar’ son “Amel-Markduk” took the throne and then was assassinated. He was followed by Neriglissar who reigned only four years and then died. His son, was murdered 9 months later, after which Nabonidus was chosen. But, he, in effect, abdicated the throne in favor of his worthless son Belshazzar. So, the majestic nature of Babylonian politics fell into ruin, giving place to unstable, self-centered and feeble monarchs, while the reign of self centered Belshazzar brought the kingdom to its knees. To Daniel, the symbols became reality right before his very eyes! Bear in mind that all these figures were etched vividly in Daniel’s mind for at least 13 years before he was brought in before Belshazzar in Daniel 5:13. His scolding of Belshazzar reflects his disgust having witnessed such irresponsibility, wanton waste, and utter degradation as compared to Nebuchadnezzar’s style of rule as well as his failure to learn from his grandfather’s hard experience. Verse 5: And behold another beast, a second, like to a bear, and it raised up itself on one side, and it had three ribs in the mouth of it between the teeth of it: and they said thus unto it, Arise, devour much flesh. Back in 603 B.C., when Daniel told Nebuchadnezzar “after thee shall arise another kingdom inferior to thee” (Daniel 2:39), he probably had little idea what kingdom that was. Now, 50 years later in 553 B.C., (the “first year of Belshazzar”) great changes had taken place in the political landscape besides that which transpired in the Babylonian empire. It was in 553 that Cyrus, who succeeded his father Cambyses I the Persian king, rebelled against Astyages king of the Medes. Although it was three years later before Cyrus came off victorious, Cyrus’ revolt, in the kingdom adjacent to Babylon, must have clicked in Daniel’s mind when he saw this “second” beast raise itself up “on one side” over the other. Therefore, even though, to my knowledge, archeologists have failed to unearth artifacts using “bear symbols” to represent Medo-Persia like the lion figures of Babylon, the diminishing state of Babylon at the time compared with the rise of Medo-Persia in addition to the sequence seen in Nebuchadnezzar’s dream of long ago, Daniel must have had a pretty good hunch, even during Belshazzar’s first year, that the lopsided bear represented, Medo-Persia as the nation that would succeed Babylon. But why did God use the figure of a single animal to represent the two nations of Medo-Persia? History tells us that Astyages, who was the dominate king of the Medes at that time, was Cyrus II’s grandfather. Furthermore, Cambyses I, the ruler of Anshan (or Persia), and father of Cyrus II, was married to Mandane, Astyages’ daughter which made Cambyses to be Astyages’ son-in-law. Therefore, it was very appropriate to use one animal to represent both nations in view of the very close blood relationship existing between their rulers. But, other than the bear raising itself up on one side, and the sequential relationship of the silver to the gold in Nebuchadnezzar’s dream, there was nothing else for Daniel to hang his hat on. While the command “Arise, devour much flesh” was clearly an indication of the coalition’s brute strength, what the “three ribs” in its “mouth . . . between [its] teeth” represented had to be left to future developments to establish. But, at least, Daniel must have suspected that Babylon would be one of them! According to historians “Cyrus did not venture into Egypt, as he himself died in battle, fighting the Scythians along the Syr Darya in August 530 or 529 B.C.,” nine or ten years after Daniel had this vision. However, Cyrus “was succeeded by his son, Cambyses II, who managed to conquer Egypt during his short rule.” So, Egypt must have been the third “rib” between the bear’s “teeth.” By that time, Daniel had already passed on to his grave. He had only “prospered in the reign of Darius, and . . . Cyrus.” (Daniel 6:28) and probably died sometime during the reign of Cyrus. Verse 6: After this I beheld, and lo another, like a leopard, which had upon the back of it four wings of a fowl; the beast had also four heads; and dominion was given to it. But this symbol, with “four wings” and “four heads” added much to the sparse, “brass” symbolism of Nebuchadnezzar’s former dream. While the two sides of the bear suggested something of a dual monarchy, the quadruple wings and heads suggested a foursome of some kind coupled with leopard-like rapidity and stealth of movement. But, in Daniel’s day from 553 to the day of his death sometime around 535, there was nothing on the political horizon indicating the possibility that Greece would occupy the position of a major world empire even though historians generally classify this time as lying within the period of “Ancient/Classical Greek period” beginning in 776 B.C. and ending with the death of Alexander the Great in 323 B.C. “The following period is classed as Hellenistic.” The so called “Persian Wars” (500 to 448 B.C.) were not to begin for another thirty-five or forty years after Daniel’s lifetime. Today, all self respecting historians readily agree that Greece was the nation that succeeded Persia even though they might scoff at the possibility anybody, even God, could predict such a thing. Nevertheless, it is readily apparent that God did predict it as we can see it clearly represented in Daniel’s great visions. Verse 7: After this I saw in the night visions, and behold a fourth beast, dreadful and terrible, and strong exceedingly; and it had great iron teeth: it devoured and brake in pieces, and stamped the residue with the feet of it: and it was diverse from all the beasts that were before it; and it had ten horns. This is the second time Daniel used the term “after this.” It was used when introducing the “leopard,” and now this “fourth beast.” Therefore, there should be no question that these beasts made their appearances one after the other, not simultaneously. But, Daniel was at a loss for words when he saw this “beast,” saying only “it was diverse from all the [other] beasts.” He could only describe its behavior, for it was moving around performing great feats of strength, braking things “in pieces” and trampling them under its great “feet,” chewing and devouring with its “great iron teeth.” That description brings to mind an intimidating, dinosaur-like animal, similar perhaps to Tyrannosaurus rex roaming at will destroying all its enemies. Its non specific name “the fourth beast,” coupled with its “great iron teeth,” certainly called to Daniel’s mind, “the fourth kingdom . . . strong as iron” (Daniel 2:40) represented by “the legs of iron” in Nebuchadnezzar’s dream. But, not all of them, such as the Anglo-Saxons, were involved in the invasion of the Roman Empire during the fifth and sixth centuries between 476 and 538 A.D. Others are not included in this list, because, later on, “a score or more barbarian tribes invaded the Roman Empire.” Those should also be included suggesting that the number “ten” is more representative of completeness rather than a literal number. Verse 8: I considered the horns, and, behold, there came up among them another little horn, before whom there were three of the first horns plucked up by the roots: and, behold, in this horn were eyes like the eyes of man, and a mouth speaking great things. Aside from the spectacular strength and intimidating behavior of this beast, its strange, “ten [little] horns” captured Daniel’s attention. Stranger still “another little horn” joined the other “ten” bringing the total number to eleven! While the former “ten” are depicted rooted in place from the start, the “little” one “came up” or grew up “among” the other “ten” suggesting it to be a late arrival. When it did arrive, it displaced three of the former with them pulled up “by the roots” leaving no trace of the three which brings the total number of the former horns down to seven. Nevertheless, “The conflict between Arianism and Trinitarian beliefs was the first major doctrinal confrontation in the Church after the legalization of Christianity by the Roman Emperor Constantine I” (272 to 337 A.D.). Therefore, the “church,” meaning the Catholic church, found its road to political power obstructed by a tainted “Christian” monotheistic doctrine that was not pagan by any stretch. Although it denied the divinity of Christ the Son who was affirmed to be merely a created being, nevertheless it gave full recognition to God the Father as the only true God. Some criticize this application thinking verse 8 mandates the “little horn” itself was to pluck up the other three by its own power. But that is a misreading of the verse which stipulates that the three were “plucked up” “before” it, not by it. Note also the “little horn” only had “eyes” and a “mouth,” feeble instruments of warfare when compared to the “great iron teeth” and the huge stamping “feet” of the “fourth beast” who consumed and destroyed all that was before it. Therefore, having the Roman generals Theodoric and Justinian to accomplish victories in behalf of the Catholic clergy was very much in keeping with the symbology representing the things that actually happened in history. 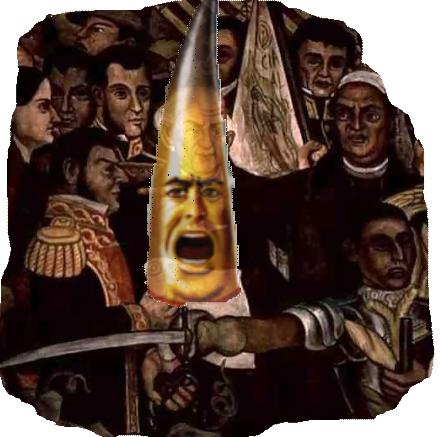 Looking back to the great image of chapter 2, it is evident that the emergence of this horn takes place in the transition point between the “legs of iron” to the “feet of iron and clay” and, in spite of its lack of military weapons, it is the iron in the “feet . . . of iron and clay” and will endure right down to the toes of Nebuchadnezzar’s image. In contrast, imperial Rome came to its end in 476 A.D. when it was overrun by the barbarian tribes of its own kingdom while papal Rome, beginning in 538 A.D., will be with us to the very end of time. Its “eyes” and “mouth speaking great things” suggests it exercised power by means of its great intelligence coupled with the ability to verbalize convincingly. While that might seem to be a severe handicap, its “eyes” and “mouth” were far more effective tools than the wings, heads, feet and teeth the others possessed. Verse 9: I beheld till the thrones were cast down, and the Ancient of days did sit, whose garment was white as snow, and the hair of his head like the pure wool: his throne was like the fiery flame, and his wheels as burning fire. Here, Daniel’s view changes from earth to heaven. In verses 1 to 8, Daniel was beholding the quadruple beasts emerging from the tumultuous sea of humanity on earth, but here, his gaze is suddenly redirected to this spectacular view in heaven. The “Ancient of days” is “God the Father” the One who existed “before the mountains were brought forth, or ever Thou hadst formed the earth and the world, even from everlasting to everlasting, Thou art God.” In other words, He is infinite. He has always been and always will be, a concept that goes way beyond what the mind can grasp. Then, adding to that mind boggling concept, he is omniscient, omnipotent, and omnipresent. A Person such as that doesn’t need anybody else to help Him. He is not obligated to inquire into the thinking or the opinion of other beings who obviously originated from His hand to begin with, for in Him, all “live, and move, and have [their] being” (Acts 17:28). But, in spite of such astoundingly, awesome attributes, other thrones were placed around His for He loves to associate with His created creatures. Then, encircling that extraordinary congregation, “thousand thousands ministered unto him and ten thousand times ten thousand stood before him” in the next verse. The only reason such a convocation would be possible is that God the Father wanted or permitted it to happen. The thought that He desired it is better than “allowed or permited” because “God is love” (1 John 4:8, 16). He actually enjoys the company of all His created intelligences! But “enjoy” doesn’t even come close to expressing the depth of His love, because, we are told, His is a “jealous God” (Ex.20:5; 34:14; Deut.4:24; 5:9; 6:15; Josh. 24:19;Nam. 1:2; 2 Cor.11:2). Superficially, “jealously” seems selfish, while “love” is untainted with selfishness. But, with God, selfishness does not exist. After all, He even gave [us] His only begotten Son!” (John 3:16) the ultimate expression of unselfishness! Therefore, with Him, “jealousy” goes deeper, and touches on the profound depth of His love, even a craving for the returned love of all His created beings! Amazing! Does He need it? No! Does He want it? Yes! But, “love” complicates the situation, for “love” cannot be forced by compulsion or coercion. Freedom must reign. Even though God is a “jealous God” He is compelled to refrain from compulsion because it would squash the tender plant of affection for Him that he craves to see implanted in the heart of all the intelligences of the universe as well as our little world. And that is the reason for this judgment scene. The all-knowing, all-powerful, everywhere-present God wants to know what His weak, little-knowing, and restricted creatures think, and what they would like to do about a problem that began when “there was war in heaven: Michael and his angels fought against the dragon; and the dragon fought and his angels, and prevailed not; neither was their place found any more in heaven. And the great dragon was cast out, that old serpent, called the Devil, and Satan, which deceiveth the whole world: he was cast out into the earth, and his angels were cast out with him” (Revelation 12:9). The first impression of thrones being “cast down,” suggests a conflict going on there. But, that is a mistaken impression. The words “cast down” is from a single Aramaic word “remah’” meaning to “to place” or “set up” as well as “to throw” down pillows or set up chairs to be seated upon. So, here, because “the Ancient of days” (who is God the Father) also “did sit,” Daniel was witnessing the convening of a judgment scene. But, in the case of Nebuchadnezzar’s dream, the heavenly counsel’s deliberation, and subsequent “decree,” was over only one individual. Here, since the context has to do, not only with the four beast kingdoms, but also “the great sea” of humanity from which the beasts emerged. Therefore, the whole human race, not just one individual like Nebuchadnezzar, is the subject under consideration in this heavenly counsel session! 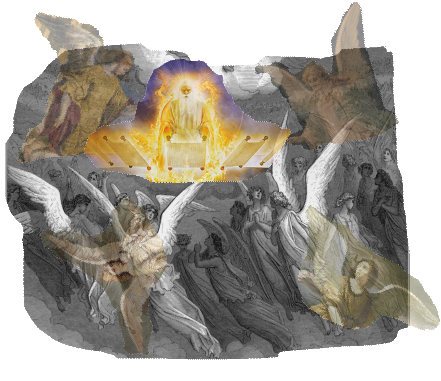 The “wheels” attached to God’s “throne,” as well as the seating action just described, suggests movement from one area to another had just taken place. In other words, this judgment scene convenes in a different place in heaven than where it was formerly conducted, such as in the case of Nebuchadnezzar. Verse 10: A fiery stream issued and came forth from before him: thousand thousands ministered unto him, and ten thousand times ten thousand stood before him: the judgment was set, and the books were opened. Other versions call this a “fiery stream” “a river of flame” or “a flood of fire.” Even though God is called “a consuming fire” (Deuteronomy 4:24; 9:3 & Hebrews 12:29) in other passages, nobody, in spite of the enormous crowd surrounding Him, is consumed in this scene. Nevertheless, His “fiery stream” implies a cleansing action is planned. Something is going to be consumed! Therefore, these “books” contain an absolutely comprehensive record of “the lives” of “every man (in the generic sense)” which includes all woman and children, from the beginning of earth’s history to its close. The parallel to “the books” must be the “book” mentioned eight times in Revelation 5. Once more we turn to the image dream of chapter 2 where “a stone was cut out without hands, which smote the image upon his feet that were of iron and clay, and brake them to pieces” (Daniel 2:34). Having learned that the phrase “cut out” (Daniel 2:34, 45) is from the Aramaic garzerin, which means “to determine . 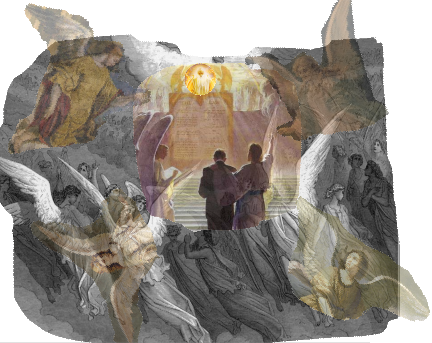 . . the deciders,’ or ‘the determiners [of destiny]’” it is clear that “the Ancient of days” is not only the heavenly “Watcher” (Daniel 4:13) who determined Nebuchadnezzar’s destiny, and the myriad of angels surrounding him besides those seated around Him on thrones as the “watchers and . . . the holy ones,” (Daniel 4:17), He is also the heavenly “Soothsayer” who convened the great heavenly judgment scene depicted here! In view of the fact that the “Son” of the “Ancient of days” was crucified in the midst of the “legs of iron” in Nebuchadnezar’s image, and that this judgment scene convened near or in the “toes” of the image, we wonder in amazement at God’s great patience! At the time of the crucifixion, we can almost hear the clamor of the voices of His short-sighted angels demanding immediate justice be done when God’s son, called “Michael,” the victorious Commander in the heavenly “war” that took place more than 4,000 years prior, hung on the cross because of the devious conspiracy of His defeated foe “called the Devil, and Satan” (Revelation 12:9) who deceived “the whole world” into committing the most ghastly crime of all time—that of actually murdering the Son of God! Verse 11: I beheld then because of the voice of the great words which the horn spake: I beheld even till the beast was slain, and his body destroyed, and given to the burning flame. Seemingly, “the great words which [it] spake” were so loud Daniel was distracted from the thought he left off with in verse 10 regarding the setting up of the judgment. But, there must be a deeper reason than mere distraction. This verse continues the thought Daniel left with in verse 8 where the “little horn” not only possessed “eyes like the eyes of man,” but had a “mouth speaking great things.” Those “things” are the “great words” it spoke, as alluded to in this verse. Since the context of this verse is the judgment scene of verses 9 and 10, its “great words” must be directed against the “Ancient of days” echoing the sentiments of Satan who said in his “heart, I will ascend into heaven, I will exalt my throne above the stars of God: I will sit also upon the mount of the congregation, in the sides of the north: I will ascend above the heights of the clouds; I will be like the most High” (Isaiah 14:13, 14). The question is: “who is the beast?” Could it be one of the others mentioned in verses 3 to 8, with the “fourth” being the most likely? The Commentary rightly declares: “Was slain . . . represents the end of the system, or organization , symbolized by the horn.” If we are willing to accept that statement, it rules out the lion, bear, leopard and even the “fourth beast.” Therefore, “the beast,” in verse 11, must be the fully developed form of the “little horn” power. Then, verse 11 concludes with the “body” of the “beast’s” power being “destroyed, and given to the burning flame.” Is that the post millennial “lake of fire” depicted in Revelation 20:14, 15? Before deciding, wait until our study reaches Revelation 6, 17, 18 and 19 that provides much evidence for the answer to that question. Verse 12: As concerning the rest of the beasts, they had their dominion taken away: yet their lives were prolonged for a season and time. When Babylon was defeated by Medo-Persia, Babylon ceased to exist. When Persia was defeated by Greece, Persia ceased to exist. When Greece, in its Hellenistic form, was overwhelmed by Rome, Greece ceased to exist. When Pagan Rome was replaced by Papal Rome (in the form of the “little horn”), Pagan Rome ceased to exist. The same thought of incompatibility is thoroughly confirmed in Nebeuchadnezzar’s dream of the great image composed of the gold that was incompatible with the silver, then the brass that was incompatible with the silver, then the iron that was incompatible with the brass, followed by its incompatible mixture of iron and clay. Nevertheless, that is the conclusion required by the wording of this verse if we insist that the four beasts of verses 3-8 are “the rest of the beasts” Daniel refers to in verse 12 who will still be alive after the “horn” power is destroyed. As we might expect, there are no clear, definitive answers to that question in the book of Daniel, although there are some hints as we shall see. Therefore, we must, at this point, defer a clear answer until our study reaches the book of Revelation that only begins in chapter 13 verses 1-10. There we will see where the “little horn” power has developed into a “sea beast.” Other subsequent passages in the book of Revelation will then round out a complete and satisfactory answer to this difficult question. 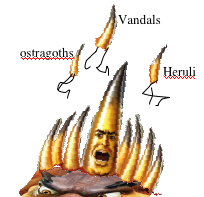 At this point, a partial answer can be supplied to the question of the fire that destroys the “body” of the horn-beast. 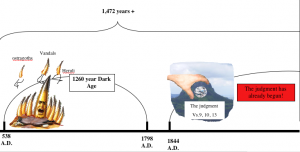 We can say that it could not be the post-millennial lake of fire depicted in Revelation 20:14, 15 because all beast powers (called “the rest of the beasts”) will be destroyed in it leaving none of “their lives” to be “prolonged [even] for a season and time.” Therefore, we are compelled to look for an alternative to the post-millennial lake of fire. The book of Revelation makes clear when that fire will do its work. Verse 13: I saw in the night visions, and, behold, one like the Son of man came with the clouds of heaven, and came to the Ancient of days, and they brought him near before him. This verse brings completion to the judgment scene presented in verses 9 and 10 and after the parenthetical scenario of verses 11 and 12 depicting the interference of the “horn” against the purpose of God to bring the Great Controversy between good and evil to a close. 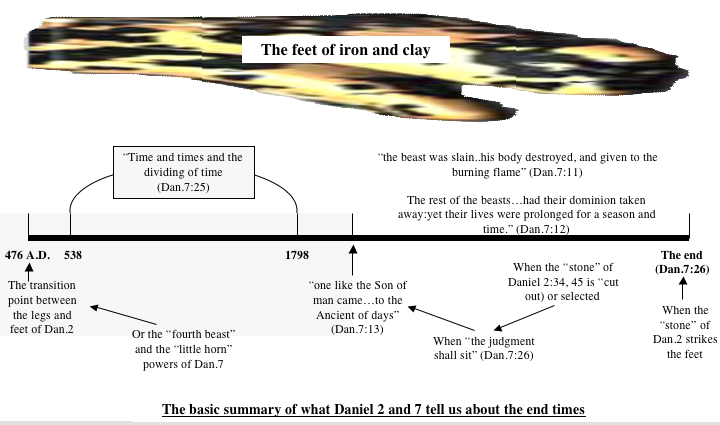 Having addressed the ultimate fate of the “horn” in “the burning flame,” Daniel comes back in time to the chief event in the judgment scene which is the coming of “the Son of man” “to the Ancient of days” to initiate the proceedings of the Investigative phase of the final Judgment. Even though verses 10 and 13 suggest “the judgment was set, and the books were opened” before the “Son” “came forth,” we can be sure such is not the case. For example, Jesus Himself said: “the Father judgeth no man, but hath committed all judgment unto the Son” (John 5:22). The parallel scene in the book of Revelation confirms that the “Lamb . . . came and took the book out of the right hand of him that sat upon the throne” after He was judged “worthy to take the book, and open the seals” that kept it closed. It had to be that way because no one else either “in heaven, nor on earth, neither under the earth, was able to open the book neither to look thereon” (Revelation 5:3, 6, 7). Consequently, the sequence is the same here with “the Son of man” coming “to the Ancient of days” at the same time “the judgment was set and the books were opened” by “the Son of man” Himself! But, the investigative phase of the judgment has already been depicted at least three times up to this point. Remember Belshaszzar who was “weighed in the balances and found wanting” (Daniel 5:27), then Nebuchadnezzar who was being watched by the “watcher” and the “watchers” (Daniel 4:13, 17). Finally, the “stone” that was “cut out of the mountain without hands” (Daniel 2:45) that could be reworded “the stone, representing God’s people, was selected out of all the people in the world by the heavenly soothsayer, to bring an end to Satan’s government.” The “stone” striking the great image on its feet really portrays the executive phase of the judgment which follows the investigative phase that is going on in heaven right now. Verse 14: And there was given him dominion, and glory, and a kingdom, that all people, nations, and languages, should serve him: his dominion is an everlasting dominion, which shall not pass away, and his kingdom that which shall not be destroyed. This verse depicts God’s purpose for the judgment, to establish His “everlasting dominion” in place of the crumbling, Satanic “dominion” represented by the “great image” of gold, silver, brass, iron, then iron mixed with clay. Each of those five primary dominions of the earth did “pass away” because they were established by fear, hate, superstition, and force. Love for God nor man played no part in their agendas. Verse 15: I Daniel was grieved in my spirit in the midst of my body, and the visions of my head troubled me. As we have already seen, many things were happening around him that could have contributed to his distress besides what was shown him in vision. Since this chapter reflects back to Belshazzar’s “first year,” he had not yet been called into Belshazzar’s feast to decipher the handwriting on the wall of the palace for the terrified king. But he had just learned of Nabonidus’ decision to employ his self centered, egotistical son to be coregent with him on the throne which must have added to the general picture of internal turmoil in court life ever since the death of Nebuchadnezzar. Daniel tells us nothing about his experiences or duties during that time, but it could not have been pleasant, not knowing from day to day just where he stood with the various kings that came and went, ending with this irresponsible chap who cared nothing for anybody else but himself. By this time, his hope that somehow Nebuchadnezzar’s experience with God would rub off on his successors had long since vanished. Then, being given a visionary collogue of figures and symbols depicting more turmoil and conflict could well have added to his sense of distress and anguish. Nevertheless, his faith remained strong, because he had some questions to ask. Verse 16: I came near unto one of them that stood by, and asked him the truth of all this. So he told me, and made me know the interpretation of the things. Evidently, Daniel was still in vision while seeing himself approaching an angelic being whose name, although not given here, could well be Gabriel who is named in the next two chapters. Asking “him the truth of all this” suggests he wanted to know for sure his understanding was correct before sharing it with others. Asking about “all this” covers everything from the lion to the “Son of man’s” approach to the Ancient of days. Verse 17: These great beasts, which are four, are four kings, which shall arise out of the earth. So, the angel complies with Daniel’s request starting with the “four great beasts [which] came up from the sea . . .” (verse 3) but, here, he says they “arise out of the earth.” Is that a contradiction? No. Keep in mind what Daniel just said in verse 16 that this is “the interpretation of the things.” One of the “things” is that the “sea” represents the things of “earth,” and the “things of earth” represent the comings and goings of nations and kingdoms on the earth. It has to be that way because “kings” or “kingdoms” arise either by appointment or by conflict. They, if we were to attempt a literal interpretation, were neither submarine nor subterranean! Verse 18: But the saints of the most High shall take the kingdom, and possess the kingdom for ever, even for ever and ever. This angelic interpretation was exceedingly brief. While the “four” “great beasts” of verse 17 parallel the first four parts of the great image of chapter 2, the parallel to this verse skips any reference to its “feet, that were of iron and of clay” and passes to “the saints of the most High” represented by “the stone that smote the image [and] became a great mountain, and filled the whole earth” (Daniel 2:35) which is still future. According to verse 7, the “fourth beast” succeeds the “leopard” who succeeded the “bear,” who succeeded the “lion” after it was made to “stand upon the feet as a man” proving they did not coexist. Since Daniel does not inquire about the previous three beasts, he had no doubt that the “lion” who, to him, clearly represented the present kingdom of Babylon. 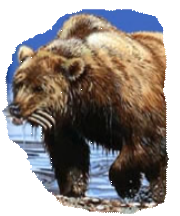 It probably seemed clear, at that time, the “bear” depicted the kingdom lying adjacent to Babylon and could well be the one who would displace Babylon. While the “leopard” would have been far more difficult for him to understand at this point, the “fourth beast” was, to him, far more mysterious as well as exceedingly dreadful. Verse 20: And of the ten horns that were in his head, and of the other which came up, and before whom three fell; even of that horn that had eyes, and a mouth that spake very great things, whose look was more stout than his fellows. In verse 7 Daniel notes that the “fourth beast” only “had ten horns,” that we assume, are carried on his single head. Here in verse 20, he declares they “were in his head” which confirms that assumption. While the “leopard” had “four heads,” the “fourth beast” had only one. This is an important point to recognize because the obvious parallels to the “ten horns” are found in the book of Revelation. 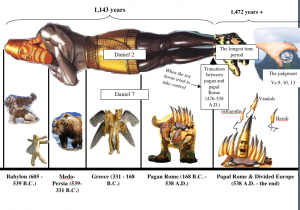 But, they, according to Revelation 12, 13 and 17, are positioned on multiple “heads,” while those of the “fourth beast” are positioned on one, single “head.” So, while the “ten horns” of Daniel and Revelation are similar, they should not be considered exact parallels. Although Daniel makes no mention of it in verse 8 where he alluded to the eleventh “little horn” having ‘the eyes of man, and a mouth speaking great things,” here he says that it “made war with the saints,” and even worse, “prevailed against them,” which were additional things he saw but not mentioned in verse 7. The same thought is found in Daniel 8:23, 24 where that king’s “look” is depicted as a “fierce countenance.” And his “power shall be mighty, but not by his own power” suggesting it comes from some other body or organization other than its own. Again in Daniel 11:21, 23 we see another prominent figure who “shall come in peaceably, and obtain the kingdom by flatteries” instead of force of arms and is thus able to “become strong with a small people” instead of a large army of its own. Note that the horn power “prevailed against” the “saints,” even though, in verse 18, the “saints of the most High” took “the kingdom” and possessed it “for ever and ever.” Therefore, the saint were victorious only because of God’s favor, not because of anything the “saints” could do except to depend on God for their salvation like Daniel and His three friends in chapters 3 and 6. Verse 22: Until the Ancient of days came, and judgment was given to the saints of the most High; and the time came that the saints possessed the kingdom. The parallel to the coming of “the Ancient of days” here is in verse 9 where “the Ancient of days did sit” suggesting He came from one position in the heavenly sanctuary to another as intimated by the “wheels” of motion depicted in the same verse. So, verses 19-22 itemize what Daniel wanted to be certain about, namely the “fourth beast,” its “ten horns” and especially the eleventh “horn.” He then adds something about that “horn” not previously mentioned. While he already noted it had “a mouth speaking great things” and implied it had an intimidating demeanor, in verse 21 he notes it “made war with the saints” and even “prevailed against them” . . . things he did not mention in verse 8 just before “the Ancient of days came” in verse 9. After that, he concludes with the same point the angel left off with in verse 18 when “the saints possessed the kingdom,” nearly the same wording found in this verse. Interestingly, he says nothing here about the demise of the “horn” depicted in verse 11 or “the rest of the beasts” seen in verse 12. But, when our study reaches Revelation 17, 18 and 19, far more information relating to those details is provided. Verse 23: Thus he said, The fourth beast shall be the fourth kingdom upon earth, which shall be diverse from all kingdoms, and shall devour the whole earth, and shall tread it down, and break it in pieces. This is again the angel that Daniel approached in verse 16 whose brief reply in verses 17 and 18 did not satisfy Daniel’s inquiry causing him to itemize the things he was concerned about in verses 19 to 22. So, the angel, kindly complies with Daniel’s request in the next five verses. So, in answer to Daniel’s request beginning in verse 19, the angel begins with the “fourth kingdom” that was to succeed Nebuchadnezzar’s Babylonian kingdom in the distant future (to Daniel’s time). Of course, many other kingdoms rose and fell throughout many other parts of the world other than western Europe during the 1,081 years of history from Babylon to the end of pagan Rome. We can be certain God was fully aware of them all and could well have given far more information than He did, but he chose to confine Himself to details which he knew would be recorded in easily accessible records of the past for future generations. For example, while many kings and kingdoms sprung up and were put down in, for example China, Japan, and even North and South America, accurate records of their past would have been exceedingly difficult, if not impossible  to find and then be able to correlate them with any symbolic language God could provide. He had to confine Himself to a representation of western civilization in order to give us something that could be confirmed in easily accessible history books. Therefore, even though no symbols representing these other kingdoms are found in Daniel or John’s prophecies, we cannot conclude God was ignoring all those other nations and was paying them scant attention. When “the saints” will at last possess the kingdom and record of the past will be completely opened for their review, we can be assured that wonderful accounts of God’s providence will have been wrought out in all the other nations of the earth that were not recorded in any of the history books we now possess. Therefore, “the whole earth” mentioned in verse 23 really pertains to the then-known kingdoms of the world centered around what we call Europe, some parts of the middle east as well as northern Africa, England and southern Scandinavia. Verse 24: And the ten horns out of this kingdom are ten kings that shall arise: and another shall rise after them; and he shall be diverse from the first, and he shall subdue three kings. In Aramaic, “ten” is translated from “‘asar” meaning “ten:-ten, + twelve” in Daniel 7:7, 20, 24. In Ezra 6:17 and Daniel 4:29, “’asar” is translated: “twelve!” Not being a Hebrew or Aramaic scholar, it seems to me the least we can conclude “ten” should not be considered definite in the Aramaic language. Therefore, we may have made too much of its literalness. In contrast, the number “three” is from the Aramaic “”tel-awth’” which is a “cardinal number.” Consequently, “’tel-awth” is always translated “three” or “third” as we find in Daniel 3:23, 24; 6:2, 10, 17; 7:5, 8, 20 & 24. The same applies to Ezra 6:4, 15. Therefore, we can hang our hats on the definiteness of the “three kings” who were subdued or “humbled.” Of course, Daniel could not have understood that the “fourth beast” represented the Roman Empire even though “ancient Rome was a civilization that grew out of a small agricultural community founded . . . as early as the 10th century B.C.,” long before Daniel was even born. Nevertheless, it did not appear as a world empire until 168 B.C. Another reason is alluded to right here and in verses 8 and 20 where the “little horn” uproots, causes the fall of, and subdues “three [of the] ten kings.” If the “ten horns” were represented by the “toes” of the great image, there should only be seven surviving “toes.” Wisely, Daniel did not specify them to be ten. Finally, the division of the Roman Empire, caused by the barbarian tribes that overran it, occurred at the transition point between the iron of the legs, and the feet of iron and clay perhaps at the ankle, but not at the time of the toes! So, the other “little horn” who “shall rise after” the first “ten horns . . . shall be diverse from the” others in that it had “eyes like the eyes of man and a mouth speaking great things” and the fact that it uprooted three  of the ten, suggest it dominated the others as well. Note how Daniel and the angel addressed the “little horn” in Daniel 7:8, 20 & 24 calling it “another . . . the other . . . and another . . .” horn suggesting sameness not distinctiveness. Although none of the others are depicted with eyes or mouths, and although the little horn’s “look was more stout than” (verse 20) the others, all eleven were really the same, character wise! Although the Catholics condemned the Arians  for teaching Christ was only a created being and not equal to the Father, the Catholics blasphemously declare Mary, the mother of Jesus, to be equal to her Son which is just as, of not more pagan than the Arian! Therefore, from heaven’s perspective, the “little horn” kingdom was just as pagan as the other ten whether or not they were pagan or had been converted to Arianism. Verse 25: And he shall speak great words against the most High, and shall wear out the saints of the most High, and think to change times and laws: and they shall be given into his hand until a time and times and the dividing of time. In verse 8, the “little horn” had “a mouth speaking great things.” In verse 11 “the horn” had a “voice” uttering “great words.” Here the angel definitively explains that the “things” and words” it uttered were “against the most High,” the “Ancient of days” depicted in verses 9 and 13 who convened the judgment scene in order to select from the “mountain” of Daniel 2:45 those He could use to destroy Satan’s earthly government. But, before He was to accomplish that objective, the eleventh “little horn” would be allowed to “wear out” or “prevail against” “the saints of the most High, the same thing depicted in verse 21. This explains the delaying action of the “horn” in verse 11 which seems to interrupt the investigative judgment scene depicted in verses 9, 10 and 13. So, how long would that “interruption” last? For “a time and times and the dividing of time.” But, how long is that? If we were to handle the “time and times and the dividing of time” in the same way, the delaying action of the eleventh “little horn” would only last three and a half literal years, during which time it would prevail against the “saints” and “wear” them “out” after which “the Ancient of days” would have come, and the “judgment” would, according to verse 22, would have been “given to the saints” who then “possessed the kingdom.” Additionally, the “horn” power would have had only three and a half years to “think” or deceive himself that he had changed the “times and laws” of God. Did Daniel think the “time and times and the dividing of time” was only three and a half years and that the prophetic, day-for-a-year time was a method of time interpretation that only came to be understood later on? According to the last verse of this chapter where Daniel’s “cogitations much troubled” him, it would seem that he understood that the “time, times and the dividing of times” represented 1260 years of prophetic, not literal, time because of his emotional reaction. If it were only three and a half years, it would seem that he would not be “much troubled.” Therefore, it is the context that determines the method of time interpretation, not the other way around. Note the illustration in the next verse showing that the judgment follows the time when the horn power “shall wear out the saints . . .” a contextual matter that forces the “time, and times and the dividing of time” back into history. Therefore the “judgment” commences sometime after the the “dominion” of the horn power has been taken away, at least for a while. Verse 26: But the judgment shall sit, and they shall take away his dominion, to consume and to destroy it unto the end. This is the “judgment” depicted in verses 10 and 22 that is understood to be the Investigative Judgment that began October 22, 1844. However, Daniel could not have known that until after receiving the next vision depicted in Daniel 8. Neither could he have understood the date we consider to be 1844 because Jesus, whose birth took place in 4BC, happened some five hundred years after Daniel’s time. Neither could he have known that our dating system of today began in “BC” or before Christ and continues into our time known as “AD” time. From Daniel’s perspective, the time periods were marked out by the time the various kings ruled such as we see in verse 1 of this chapter where “the “first year of Belshazzar” is alluded to. Nevertheless, as we look back through the eyes of the historian, prophetic day-for-a-year time is the only application we can be comfortable with because it makes good sense. Furthermore, it coincides well with the the Dark Age of the past that, did indeed, last 1260 literal years from 538 AD to 1798. Therefore, this verse explains the delay implied between verses 10 and 11 when the proceedings were interrupted by “the voice of the great words which the horn spake” during the Dark Age for “a time, and times and the dividing of times,” which is three and a half years of “prophetic time” or 1260 years of literal time. It began in the years 538 when Belesarius forced the Visigoths out of Rome, and ended in 1798 A.D. when the French general Berthier took pope Pius VI prisoner. After that, the way was wide open for “one like the Son of man” (verse 13) to come “to the Ancient of days” in the heavenly sanctuary and open “the books.” But, since the “dominion” of the horn power is now growing instead of being taken “away” and his “body” remains unconsumed, it is clear the “judgment,” staffed by the “Watcher (the ‘Ancient of Days’)” and “watchers” (Daniel 4:13, 17), is still out on that question. But, when the decision is reached, “the beast [will be] slain, and his body destroyed, and given to the burning flame” depicted in verse 11. This illustration shows where the judgment scenario of verses 9, 10 and 13 fits with the general scheme of things in Daniel 7. Although we will learn more about the date “1844” in the next chapter, I felt it necessary to bring it in at this point in order to round out what we have learned here. If the hand, which belongs to God, shown selecting the diamond “stone” is confusing to you, go back to our study of chapter 2 where you will find it explained more fully. Isn’t it awesome to understand that the judgment has already begun and that you and I could well be numbered with that diamond and be used by God to carry out His agenda like the three Hebrews in chapter 3? Stay with me in this study and we will discover more about God’s sacred agenda. Verse 27: And the kingdom and dominion, and the greatness of the kingdom under the whole heaven, shall be given to the people of the saints of the most High, whose kingdom is an everlasting kingdom, and all dominions shall serve and obey him. Verse 28: Hitherto is the end of the matter. As for me Daniel, my cogitations much troubled me, and my countenance changed in me: but I kept the matter in my heart. In spite of this conversation leaving Daniel in a state of depression, most likely due to the unexpected length of time involved for God’s purposes to be worked out, two years later, “in the third year of Belshazzar,” an even longer time period was to be revealed to him that would cause him to “faint” and become “sick” for “days” thereafter. He would have been even more depressed had he known that the eleventh “little horn” would not even arrive on the scene until 1,093 more years after his time! God, knowing the effect this news would have on His servant was therefore merciful in measuring out the information in amounts more easily assimilated. While these prophecies were not necessarily essential for the spiritual welfare of people living during Daniel’s time, we can see today that their importance has grown with the lapse of time. We can now look back and gain much comfort and assurance from them knowing that God is in charge. Very soon, now, the “stone” representing God’s people, will be the instrument in God’s hand to vindicate His character in the face of Satan’s vitriolic charges against God’s government. Then God will replace Satan’s government with His own. 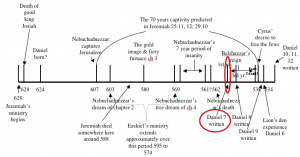 Summary of chapter 7: It is important for us to understand the parallels between Nebucadnezzar’s dream in chapter 2 and that of Daniel’s vision in this chapter which is a “fleshing out” of the skeletal outline of future events, first given to Nebuchadnezzar. While chapter two is a cryptic, highly symbolic outline, chapter 7 gives us many characteristics of the same kingdoms not represented in Nebuchadnezzar’s dream. More importantly, it spells out the meaning of the “stone” that was “cut out without hands” from the “mountain,” which symbolizes what the investigative Judgment depicted in verses 9, 10 and 13, is all about. The apparent delay caused by the little horn, whose voice was heard between the time when the “judgment was set and the books were opened” (verses 10 and 11) and the coming of the Son of man to the Ancient of days in verse 13, is an important detail for us to understand. But, chapter 7 is not the end of the story. There, being far more for us to study, chapter 7 is really a bridge, setting the foundation for our understanding of chapter 8, then 9, then 10-12 and even farther into John’s vision depicted in the book of Revelation! The word “sum” is from the Aramaic “re’sh” meaning “the chief” or “essential content” of the “dream, visions” and “matters” (plural). see Seventh-day Adventist Bible Commentary Vol.4 page 820 (bottom left to top right). It refers to S.H. Langdon, in: Semitic Mythology: The winged lion is one of the forms of the beast often pictured in combat with Marduk, the patron god of the city of Babylon. Some may doubt that the “book” of Revelaltion 5 and the “books” of Daniel 7:10 are parallel. If that’s the case I suggest looking up the following references: 20MR 197; 12MR 296; and 9MR 7 which convince me the “book” of Rev.5:1, 2, 3, 4, 5, 7, 8 and 9 contains the same absolutely comprehensive record as the “books” of Daniel 7:10. From the Online Computer Lexicon: “ten” #6236 rse `asar (Aramaic) as-ar’ masc. hrse `asrah (Aramaic) as-raw’ corresponding to 06235; TWOT – 2932; n m/f KJV – ten 4, twelve + 08648 2; 6. 1) ten.” While it is translated “ten” in Daniel 7:7, 12, 24, the same word is translated “twelve” in Daniel 4:29 and Ezra 6:17. From the Online Computer Lexicon: “three” #8532 tlt t@lath (Aramaic) tel-awth’ masc. htlt t@lathah (Aramaic) tel-aw-thaw’ or atlt t@latha’ (Aramaic) tel-aw-thaw’ corresponding to 07969; TWOT – 3058a; n m/f KJV – three 10, third 1; 11. 1) three; 1a) three (cardinal number); 1b) third (ordinal number).” It is always translated “three” or “third” in Ezra 6:4, 15; Daniel 3:23, 24; 6:2, 10, 13; 7:5, 8, 20 and 24.
 see SDA Bible Commentary Vol.4, page 826 (under “ten horns”) Interestingly, the Commentary also notes that “a score or more barbarian tribes” could be considered under that list. If Daniel had understood the “times, time and the dividing of time” to represent a literal three and a half years, he would have been delighted, especially because, in Belshazzar’s “first year,” another 16 years of the seventy year period of promised Babylonian captivity remained. His reaction to this news confirms he understood it to be far longer.